“Everybody has great offseasons, right?” asked Brian Kelly at his first preseason press conference a couple of weeks ago. “Who doesn’t have a great offseason?” He’s right, of course; August is peak harvest time for the ripest, richest coachspeak. But those of you allergic to Fighting Irish football hype and those of you forever allegiant to Touchdown Jesus, hunker down and know that you suffer together: Notre Dame’s going to be really good this year. Really. He’s not wrong about the depth. Despite the departure of Golson, this team has more eye-popping potential than the 2012 squad did. That group rode an undefeated regular season, including victories over then–no. 10 Michigan State, no. 18 Michigan, no. 17 Stanford, and no. 8 Oklahoma, into the national title game (where they were summarily dispatched by Alabama, but still: It’s not a place you expect to find a team that needed triple overtime to beat a 4-4 Pitt squad). Zaire will be shielded by an experienced offensive line that is without longtime starter Christian Lombard but retains left tackle Ronnie Stanley, who skipped the NFL draft to return for his senior season. New OC hire Mike Sanford’s toy box contains a 1,000-yard receiver in William Fuller and two 500-yarders in Corey Robinson and Chris Brown. A fourth, slot receiver C.J. Prosise, has been working out at running back, where the Irish bring back last year’s leading rusher, Tarean Folston, but have reportedly lost the sidelined Greg Bryant to a Florida juco. Even with an ongoing quarterback transition, the offense is a lesser concern than the defense, the development of which was repeatedly stalled last year as the unit lost one player to injury after another (after another). The summer has not been as kind as it could be to second-year DC Brian VanGorder: Kelly announced Saturday that redshirt junior defensive tackle Jarron Jones, who recorded 7.5 tackles for loss and 1.5 sacks in 2014, will miss the upcoming season following an MCL injury. His backup is Jerry Tillery, a true freshman and former four-star prospect out of Shreveport. 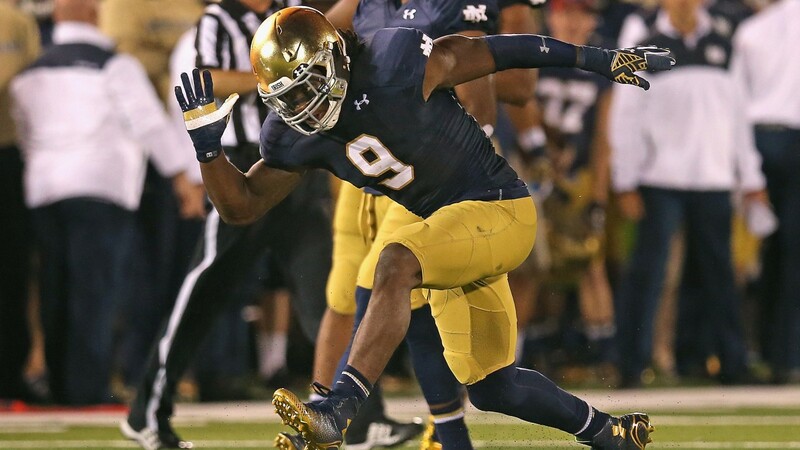 Jonathan Daniel/Getty Images Notre Dame linebacker Jaylon Smith celebrates a tackle for a loss against Michigan. But the place to train your eyes will be the linebacking corps, returning five of six members who recorded a tackle for the Irish in 2014. The guy roaming around with the assured grace of an apex predator is Jaylon Smith, who led the unit in tackles in 2014. Joe Schmidt, the former walk-on who rose to become a starter, returns from a broken ankle sustained against Navy. Schmidt is one of those guys with a natural gift for stage-managing a defense while the game is in progress; by midseason last year, Smith had become his lieutenant for on-field adjustments. The prospect of both of them getting to play a full season together is pretty swell, if you’re into cerebral malice. One final piece not to overlook: Kicker/punter Kyle Brindza, who ranked third in the nation last season in touchbacks, has been lost to the Lions. (As in he’s playing professional football in Detroit, not as in he’s been spirited away to ancient Rome and thrown into gladiatorial combat. Emotionally, those two experiences are only the tiniest bit different.) Picking up where he left off are sophomore Tyler Newsome and an incoming freshman, top-ranked specialist Justin Yoon. So Notre Dame, as the bluehairs say, has the horses. Now, the conundrum: Where to place the Irish in your expectations constellation for 2015? If it feels like large swaths of the college-football-consuming population are locked in an unending struggle between This Is Notre Dame’s Year and Notre Dame Is Overrated, it’s only because that’s exactly what they’re doing, and they are tireless at it. Crowing about Notre Dame football and hating on Notre Dame football have both become their own discrete spectator sports, and it’s hard to tell at any given moment which band of fans is having more fun at its chosen pastime. Best of all, there’s no end in sight to determining who’s right: It might surprise both sides of the aisle to learn that, since the turn of this century, Fighting Irish football has entered the season ranked eight times, and come in unranked eight times, and that five of those ranked preseason teams have gone on to finish outside of the top 25 cutoff, while four of the unranked teams climbed into the top 25 by season’s end. So by that totally infallible science, our courses are set just by looking at the roster, and the schedule, and making the educated guess that there’s no way the Irish get left out of next week’s AP poll, right? If you’re a Fighting Irish hater, time to sharpen your fangs and howl at what you view as the perpetual glow of expectation surrounding the program, all the while bracing yourself for a potential playoff run! If you’re a Notre Dame diehard, and you’re superstitious, it’s time to get nervous, because it looks like they’re going to be a very good football team, which is where things sometimes start to get weird. The Irish might not need any help beating the Longhorns, but Notre Dame’s offense versus a Charlie Strong defense is reason enough to put on NBC. The really interesting first hurdle, though, won’t come until Week 3, with a visit from potentially deadly Georgia Tech. And while it’d be deeply silly to peek past September at this point, tread just a couple of days into October and look at what the Irish have to do: go into Clemson and defend against Watson and pals, who’ll be coming off a bye week. Those three games aren’t the last you’ll want to see of Notre Dame this year, but they’ll tell you a lot. “Reply Hazy: Try Again In Week 5” reads this contraband Magic 8 Ball. Unfortunately, those toys rarely add “and then start praying thrice a day to whichever saints govern the well-being of tendons,” but in the case of Notre Dame, they probably should. This post has been updated to reflect Brian Kelly’s announcement that KeiVarae Russell has been cleared by the NCAA. Look, at the time, that was kind of a big deal, if more for rivalry than for football reasons! There were bad decisions by Golson, and there were boneheaded mistakes, and then there were times like at Arizona State, where he committed three turnovers in four minutes and it seemed clear he’d gotten on the wrong side of some supernatural force. In 2014’s USC–Notre Dame game, Kessler more than got the better of the Irish aerial defense, racking up 372 yards and six passing touchdowns.